Reference 18038 most notably features a sapphire crystal and an upgraded caliber 3055 that enabled a quick set date function. These were two upgrades from reference 1803, which was fitted with an acrylic crystal and did not allow the wearer to simply change the date by pulling out the crown half way. 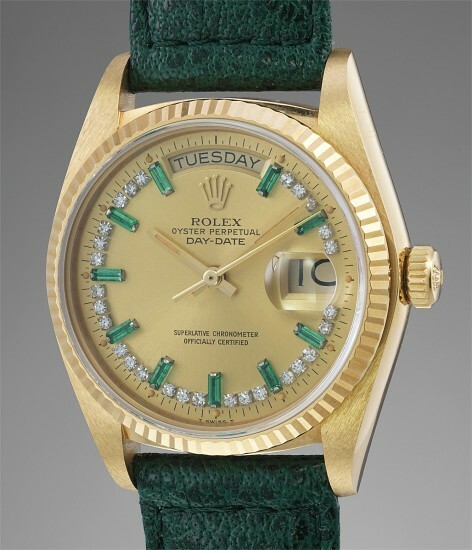 The present watch is one among an exceedingly limited number of Day-Dates featuring emerald baguette numerals. Bright and translucent, the diamonds and emeralds pop against the champagne dial, giving the watch a singular appearance. Such examples come to the market very rarely, and when they do, it is a notable occasion. This timepiece is preserved in excellent condition, with crisp hallmarks beneath the lugs. Most probably unpolished, it even features the original Rolex sticker on the caseback, attesting to its untouched condition.